In 1991 United went back to classic British sportswear manufacturers Bukta, who had last supplied the Club with strips during the early 1970s. After falling out of favour during the 1980s, Bukta were at the time re-emerging as a popular kit supplier, and were already supplying several British clubs, including Aston Villa, Crystal Palace, Hearts & St Johnstone. Bukta’s design had the Club’s crest embossed throughout the material of the top, with a thick black strip with white trim running down from the collar to the end of the sleeve on each side. There was a new black polo style collar, complete with V opening placket with a single button, and studs on the wings of the collar. For a fourth consecutive season, the now familiar white text of Belhaven appeared in its black box on the front of the shirt. The black shorts continued the design of the top, with a thick tangerine strip with white trim running down either side, and for the first time, a simple Club badge also appeared on the bottom front right. The socks continued the design from the Asics strip, tangerine with black trim and a white sole. 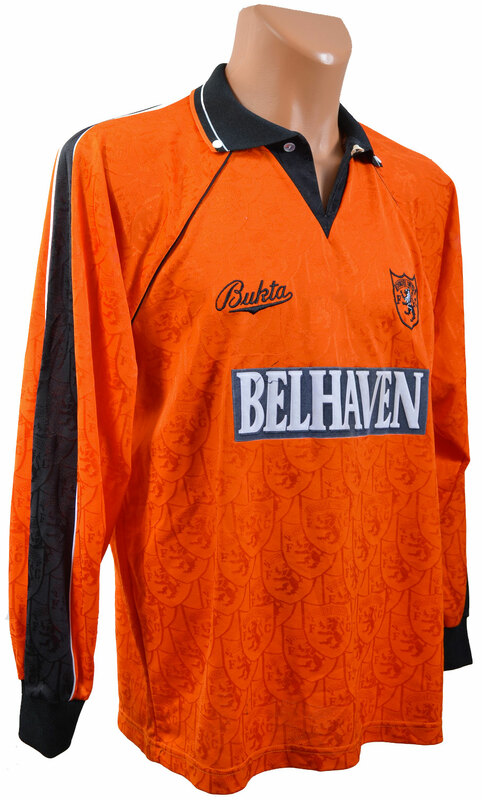 The new Bukta strip appeared for the first time in Maurice Malpas’ testimonial match against Rangers in the build-up to the 1991/92 season, and its competitive debut was in a pulsating 4-3 defeat to Celtic in the opening match of the campaign at Tannadice. Originally meant to be for two seasons, the Bukta kit deal collapsed when the manufacturers were faced with severe financial difficulties just weeks into the 1992/93 season. There was a rescue buy out, but many kit deals, including United’s, were cancelled, and the Club were forced to look elsewhere for a kit supplier. With yet another 4th place finish in the Premier Division, United failed to qualify for Europe, and didn't get far in the Cup competitions. A young Duncan Ferguson was now established in the side, and formed a deadly striking partnership with Darren Jackson, and the season also saw the arrival of several South American players, most notably Victor Ferreyra and the infamous Walter Rojas.